How do bacon novelty items get that bacon smell? Bacon products should probably have bacon in them—right? Rocco Loosbrock, founder of online marketplace BaconFreak.com, certainly thinks so, noting that the best kind of bacon-flavored snack always contains real bacon, be it his maple bacon breakfast blend tea or bacon chocolate chip pretzel cookie. Loosbrock’s store features more than 30 shades of bacon—sun-dried tomato, beer, jalapeno, Italian—just in case bacon lovers want to branch out beyond the usual hickory flavor. But the one thing they all have in common is genuine, no-substitute bacon. 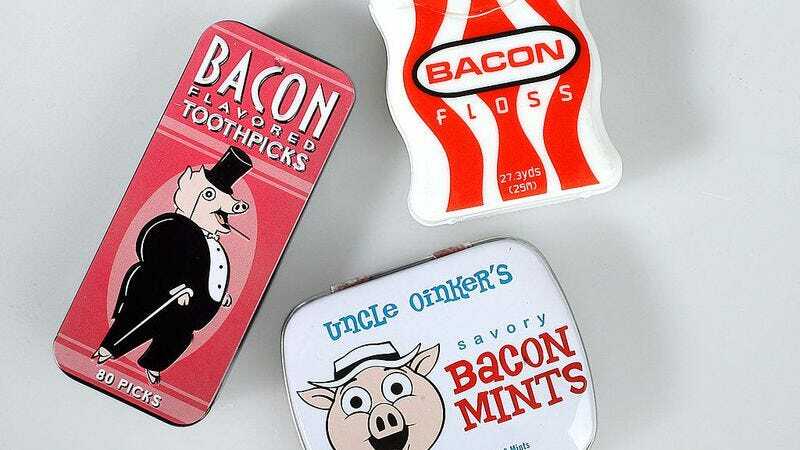 But what about all those novelty gag bacon products—bacon mints, bacon-flavored gum, bacon car air fresheners, and so on? Their taste and scent of bacon, unsurprisingly, has a slightly more complex, modern recipe: chemicals, plus a whole lot of patience. Still, whatever their exact formula, one thing is obvious: Most of those bacon novelty items you see don’t contain actual bacon, as it’s far too cost prohibitive (not to mention terrible for your car’s upholstery). Instead, Weaver’s bacon-scented candle, Leydon’s bacon cologne, and most of those other wacky bacon items are a cocktail of molecules whose recipe has been endlessly tweaked in an attempt to fool the senses. As pointed out by American University professor Matthew Hartings—who teaches a course titled “The Chemistry Of Cooking,” and who wrote the forthcoming Chemistry In Your Kitchen—it takes an especially acute palate to replicate the taste and aroma of bacon so closely that the brain will believe it. You could conduct your own similar experiment using a fresh pack of cooked bacon. Take the rendered fat, then reconstitute it into a lip balm (now you have real bacon kissability!). Likewise, you could extract aroma molecules using oil-based liquids, then blend them into a soap that will have you smelling of bacon—and pursued by stray dogs—all day long. These techniques, though messy and not terribly cost efficient, will create the most accurate bacon scents, because obviously, you’re basically smearing yourself with bacon. But for most companies that want to get that bacon essence, it’s a complicated process involving many chemicals with long, multisyllabic names, as well as constant tweaking, tweaking, tweaking. And even though the taste and smell of bacon is as bold as it comes, that process requires a lot of subtlety—even artistry. “Mixing these flavors is as much an art as mixing perfume,” Wahl says. “There are people who do this professionally who are really sought after.” So, the next time you take a whiff of some silly, bacon-scented doodad, remember that you’re holding someone’s expertly cooked, slaved-over masterpiece.